Cate: Please welcome Melisse Aires to my special Halloween celebration. Melisse, please tell us a little bit about yourself. Melisse: I’m a married mom of three teenaged daughters, a senior and junior twins. We live in windswept Wyoming where I teach preschool for a day job. I love to bake and crochet. I have several cats and the cutest little dog, a Morkie(Maltese/Yorkie cross) named Baxter. I’m a life long bookworm and read many different genres. I started writing children’s books and Ellery Queen mysteries—and received many rejections. Then I did a couple of years writing Buffy fanfic. I’d always been a romance reader and that steered me to writing romance. I’ve been epubbed since ’05 in fantasy, futuristic and paranormal romance. I love technology and epublishing and am excited to be part of new tech for reading. Melisse: I love everything about Halloween! I love the empowerment of being a scary thing in the dark, love autumn colors and foods. 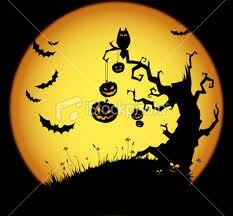 It is one of the most fun holidays in preschool, with Jack o’ Lanterns and pumpkin guts. I just bought a huge 30# pumpkin for my front yard. Baxter will dress up this year and I have a huge Jolly Jack o’Lantern costume for my preschool party. Cate: Fun! Do you have a favorite memory of a Halloween past? Melisse: We moved into our current home a couple days before Halloween, when my girls were in first and second grade. That Halloween was just magical—a full moon and the Annual Wyoming Halloween Snowstorm—big fluffy flakes. They ran from the heated car to a front door and then back to the car to stay warm! Melisse: Several years ago I had a prophetic dream! I dreamed my dark calico cat would have a white kitten with an orange spot on her head. I didn’t even know she was pregnant, but some weeks later she had a mostly white calico kitten with an orange spot on her head. We kept her--she is a sweet cat named Tubby. Melisse: Anything bad happening to my daughters! And buffalo up close. I like them over yonder on the prairie. Not by my car door--they could rip it off if they wanted to! Melisse: The top floor of the men’s dorm in college was rumored to be haunted, and some friends and I were given a tour of the empty old floor. Didn’t see ghosts—just a secret keg! Cate: Good ploy on their part, though! :) Any favorite Halloween recipes you’d care to share? 2. Shape dough into 1-inch balls. Roll in granulated sugar; place on ungreased cookie sheet. 4. Frost center of cookie with vanilla frosting to form white portion of eye. 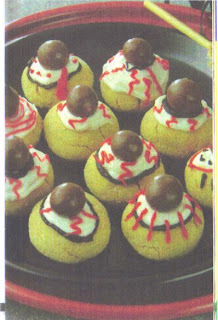 Decorate with red and black frostings to form outline of eye and bloodshot markings. Press malted milk ball "iris" into center of eye. About 4 dozen cookies. Cate: I'll have to try those! Thanks! Tell us about your release, and where readers can find it online. Melisse: The Del Fantasma Series from Aspen Mountain Press is a multi-author series centered around a paranormal bar in southern California, the Del Fantasma, and it's matchmaking vampire bartender and owner, Cody Warren. All the stories are named after a cocktail served by Cody at some point in each story. It is a fun series to write for and I’m proud to be part of it. Demonade is my second story in this series. My first is Tiger Juice. It can be found here, and soon will be on 3rd party sites like Fictionwise, ARe and Amazon. BLURB: Trudy lost her beloved sisters in eighteenth century Vienna, but she is a survivor. As a half human daughter of the demon Asmodeus, she is a psyvamp, ever young and beautiful. Unlike her dead sisters, she does not engage in relationships with men, instead she moves from club to party, city to city, stealing small amounts of life force from intoxicated young men, never staying long in any one place. She is lonely, but friendships do not work for one like her and relationships with men seem to be deadly for her kind. Father… A priest in the Del Fantasma? She turned shocked eyes to the man sitting next to her. He was huge and broad shouldered, with long rusty colored hair pulled back and tied with a leather thong. He wasn't young, there was a touch of silver at his temples and fine lines in the corners of his eyes, but he was very attractive with a strong square jaw line, high cheekbones and intelligent gray eyes behind gold wire rimmed glasses. He wasn't dressed like a priest, but wore a brown plaid flannel shirt over a tan t-shirt and khaki pants. With plain clothes and long legs he looked more like a woodcutter than a priest. He spoke with a British accent. She loved British accents. Two of her husbands had been Englishmen. He reached out a huge hand and engulfed her own in a silky hot glide of flesh before she anticipated his move. He was too young to be a husband. Too attractive. Too full of life force, all together too much of everything. She snatched her hand away just as she felt herself open to partake of his force. “Now, don't be so modest Gabriel. Guess what he studied for the Church? Just guess!” Cody's blue eyes twinkled with merriment. He shook his head back and forth. “Man, I could not make this stuff happen if I tried; Professor Gabriel De Russi is one of the world's foremost scholars on demonology,” Cody continued. "Meet Trudy, a part human daughter of Asmodeus.” He introduced her with a flourish. “Um, yes. I am older than I look.” He'd heard of her father! “I'll leave you two to get acquainted.” Cody sauntered off. Trudy took a deep breath, preparing to leave also. Cody confused her. He wouldn't put her in danger would he? She eyed the professor. Melisse: I wanted to write about two lonely people, who both had lives that veered off in ways they would not have chosen. My hero, a scholarly silver fox ex-priest, and my heroine, a stunning, ever young psy-vamp can endanger each other—and yet they are attracted to each other. Cate: Very cool. Anything else you’d like to share? Melisse: I had fun researching the Berlin cabaret district, Spanish style architecture (I want Gabriel’s house) German holy springs, demonology—from the Catholic Encyclopedia to occult sites! And I enjoyed returning to the Del Fantasma, which is such a vivid setting to me because I’ve read all the books! 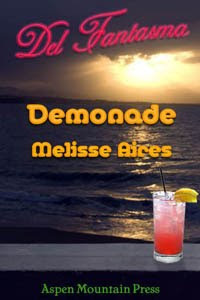 Readers should check my website, http://melisseaires.com for release and contest or giveaway news. I have another paranormal release soon and who knows, maybe another Del Fantasma idea will scream for attention. Cate: I hope so! Best of luck with it. And thanks for sharing in the celebration! Hello Melisse! I'm a little thirsty. Would you recommend the Demonade? Hm, what's in that anyway?